Walking is one of the simplest forms of exercise that can be pursued, and is appropriate for nearly all age groups and fitness levels. Walking requires very little equipment, and most people already have everything they need to get started. Pretty much all you need is a pair of good walking shoes and a place to walk. There are, however some considerations to be taken to make walking more beneficial to the exerciser. Concentrating on arm swing often yields an unnatural rhythm, resulting in either over swinging, or under swinging the arms. Under striding is when the walker takes steps that are too small. These too small steps result in an unnatural gait, and can often restrict muscle growth and tone, and even cause injury to a person’s body if the under striding continues long term. Over striding occurs when a person attempts to take a step that is too long for their body structure. This most often occurs when the walker is attempting to speed up the pace of their walk, and they intentionally “stretch” their legs out, to cover more ground. As with under striding, this can actually do more harm than good, resulting in pulled muscles and tendons. To avoid either of these, simply walk with natural speed and motion. Choose a walking speed and gait that feels right. A walker’s body will tell them when a walking speed or gait is unnatural, because it will feel that way. An unnatural walking gait yields more than simple tiredness at the end of the walk, and its effects can be harmful long term, so walkers of any fitness level should be aware of pain that goes beyond normal fatigue, and change their routine if injury occurs. 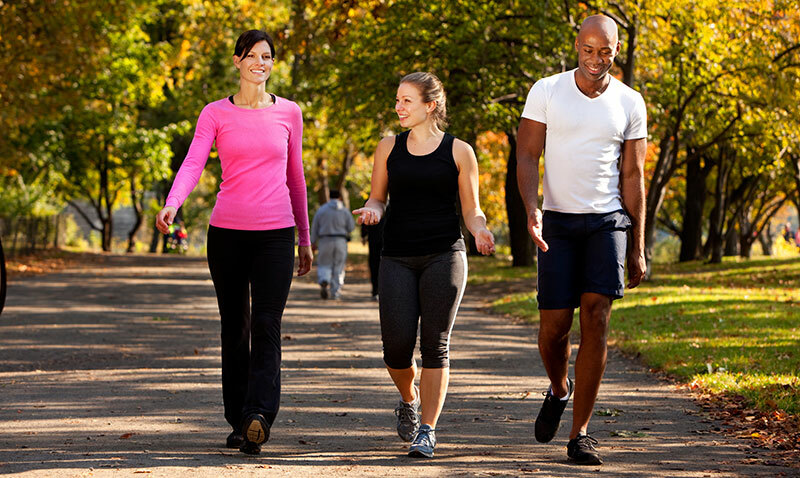 Possibly the most important aspect of walking for fitness is the walker’s posture. Don’t look down at the pavement, or at your feet. Concentrate on standing up straight and looking ahead. This is also a safety concern to keep the walker aware of obstacles that may appear in their path. By looking down, a walker puts unnatural strain on their shoulders, neck and back, leading to injury that can be avoided with proper walking posture. If the walker’s feet make a strong “flap” when they hit the ground, there are usually one of two causes: improper footwear in the form of shoes that are too stiff, or shins that need to be strengthened. To strengthen the shins, like with any other muscle group, the key is to start small and build. Concentrate on rotating your hips in a natural manner, and “pushing” your leading leg forward. Properly executed, this technique will result in the heel striking the ground, and the foot “rolling” to the ground, leaving just the toes touching when the heel of your other foot strikes the ground, preparing for the next step.